Shopping for Rudolph the Red-Nosed Reindeer Statues? For years, Rudolph the Red-Nosed Reindeer has brightened the holidays! Celebrating the special place it holds the hearts of Christmas lovers, Jim Shore reimagines the film's most iconic scenes in his signature folk art style. 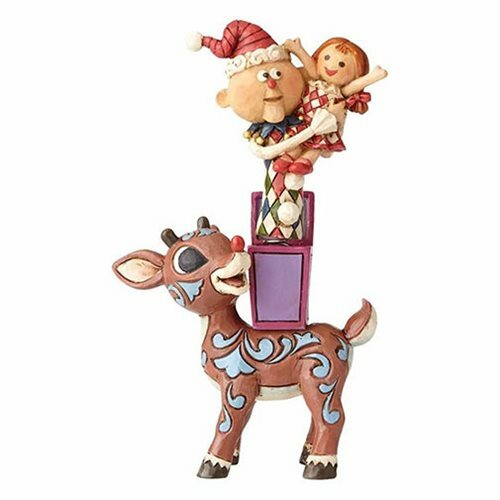 Stacked upon Rudolph's back, two joyful misfits are excited to be on their way to a new home. Beautifully designed in Jim Shore's folk art style, each piece is handcrafted in exquisite detail. The Rudolph the Red-Nosed Reindeer Rudolph with Misfits Statue by Jim Shore measures about 5 1/4-inches tall x 3 1/3-inches long x 1 3/4-inches wide.